According to recent Frost & Sullivan research, the market for video conferencing systems and services stands at $3.2 billion and is forecast to almost double to $6.3 billion by 2016. This high growth market represents an escalating demand to use video for all aspects of enterprise communications. While the business benefits of video conferencing have been tremendous, the market has been hampered by high priced solutions and performance issues. 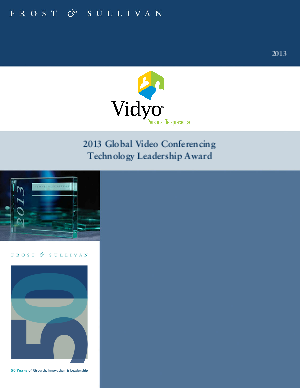 Vidyo has been a leader and innovator in breaking the old paradigm and bringing software-based architecture that is needed to deliver the scale to support hundreds of thousands of personal endpoints.